"My job is: protect the world from boogie monsters!" With the movie opening in theaters later this week, Lionsgate has launched one final red band trailer for the new Hellboy movie, directed by Neil Marshall (of Dog Soldiers, The Descent, Doomsday, Centurion). This fresh reboot of the live-action Hellboy series re-casts the main role, with David Harbour playing the big red guy with horns and a stone arm. This final trailer really plays up the hard-R rating, with excessive violence and gore and language throughout. But is the movie any good? You'll have to see it this weekend and find out. The full cast includes Milla Jovovich, Ian McShane, Daniel Dae Kim, Sasha Lane, Thomas Haden Church, Penelope Mitchell, Sophie Okonedo, Brian Gleeson, and Kristina Klebe. Who's planning to go? Anyone? Likely Hellboy fans only. You can still watch the first official trailer for Neil Marshall's Hellboy here, and also the second trailer here. For more info and updates on this new Hellboy, follow @HellboyMovie or visit their official website. Based on the graphic novels by Mike Mignola, Hellboy (David Harbour), a demon caught between the worlds of the supernatural and human, battles an ancient sorceress bent on revenge. This new Hellboy is directed by English filmmaker Neil Marshall, director of the films Dog Soldiers, The Descent, Doomsday, and Centurion previously, as well as a segment of the anthology film Tales of Halloween, and a few episodes of the latest "Westworld" and "Lost in Space" TV shows. The screenplay is written by Andrew Cosby and Christopher Golden, based on the Dark Horse comic books first created by Mike Mignola in 1993. Featuring music composed by Benjamin Wallfisch. 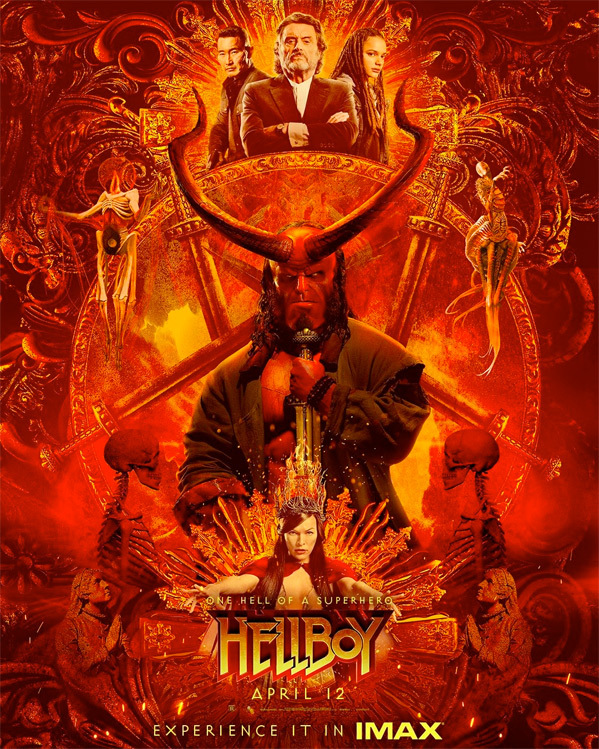 Summit + Lionsgate will release Marhsall's R-rated Hellboy movie in theaters everywhere starting on April 12th this month. Who's planning to go watch this one in theaters?